This versatile and functional seven drawer dresser will add both style and storage to your bedroom. 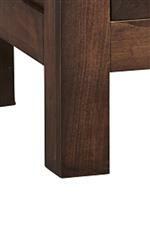 The piece is expertly crafted from robust solid wood using time honored Amish techniques, while also being available in a wide variety of different finishes. Metal accents and hardware add a subtle industrial touch, while the in vogue sliding barn door hangs on the left side, and opens to reveal two shelves. Finally, the seven total shelves provide plenty of room for all of your clothing and accessories. The Wildwood 7 Drawer Dresser with Sliding Barn Door by Daniel's Amish at Conlin's Furniture in the Montana, North Dakota, South Dakota, Minnesota, and Wyoming area. Product availability may vary. Contact us for the most current availability on this product.